August 12, 2010 Patrick McCarthy, Director of the Giant Magellan Telescope: "The Giant Magellan Telescope"
October 11, 2010 Cafe Scientifique: Sian Beilock, "Why Do We Choke?" October 15, 2010 Charles Steidel, 2010 Gruber Cosmology Prize winner: "Observations of Structure Formation in the Adolescent Universe"
December 6, 2010 Benjamin Dean Lecture: Josh Frieman, "The Dark Universe and the Origin of Structure"
The Kavli Institute for Cosmological Physics (KICP) at the University of Chicago, and Alder Planetarium will host the 10th Great Lakes Cosmology Workshop (GLCW X) from Monday June 14th to Wednesday June 16th in Chicago, IL. As is tradition, the Workshop provides a forum for advanced graduate students, postdoctoral fellows, and young faculty from the Great Lakes region working on all areas of cosmology and particle-astrophysics. More senior faculty will provide useful overviews. The general structure of the workshop includes three days of workshops (6 half-day sessions), ending the evening of June 16th. The workshop's dinner banquet will be held on Monday, June 14, 2010 at the Adler Planetarium. Contributed talks will be limited to 12 minutes, plus an additional 3 minutes for questions. In addition, contributed talks will be supplemented by slightly longer (25+5 min) talks from distinguished faculty of several Great Lakes Institutions. Talks are grouped into 1.5-2 hour sessions comprising both contributed talks by GLCW X participants and talks by invited speakers. In order to ensure compliance with the schedule, time limits will be strictly enforced, so we request that you plan accordingly. There will also be a poster session. As you may know, the University of Chicago has entered into an agreement with the Carnegie Observatories and Harvard to purchase access to the Magellan 6.5m telescopes on an ongoing basis, beginning in 2011. Our first semester of access (2011A, beginning in January) will consist of 9 nights, spread across both telescopes (the Baade or Magellan I telescope, and the Clay or Magellan II telescope). A formal call for proposals for these facilities will be issued this week, with an expected deadline of Oct 22nd. Stay tuned for further details. In the meantime, we have organized an initial tutorial on the capabilities of both the Baade and Clay telescopes. This will take place THIS Friday, Sept 17th, from 1-3pm, in RI480. If you are interested in proposing for time on the Magellan telescopes we urge you to attend if at all possible. Hsiao-Wen Chen and Mike Gladders will present an overview of the telescopes and instruments, and there will be some discussion of the proposal process with members of the TAC (time allocation committee). You may also find useful information at the observatory website. We urge you to begin reading and come with questions! A second tutorial is anticipated in October but likely not before Oct 14th due to the travel schedules of possible presenters. This week is your chance to begin thinking about Magellan proposals with lots of lead time. For over 70 years, astrophysicists have had indications that much of our universe is made up of dim or invisible material. Today, a wide variety of astronomical observations all point us to the conclusion that the vast majority (about 95%) of the energy and mass in our universe is not made up of atoms, but instead consists of exotic and rather poorly understood substances we call dark matter and dark energy. This short course will discuss what we know about dark matter and dark energy, and how we came to learn that they exist. We will also explore how future experiments might help us to better understand dark matter and dark energy, and roles that they play in our universe's past, present, and future. Cafe Scientifique: Sian Beilock, "Why Do We Choke?" There is a science to it. The brain science behind performance under stress explains why we choke under pressure as well as how we make the perfect golf swing, difficult math calculation, or business presentation look easy. We will explore why some people excel and others fail to perform at a high level when the stakes are high. Brain science studies offer counterintuitive revelations about intelligence and performance. This cafe will also include practical scientific advice about ways to not choke in high-pressure situations, and how to succeed brilliantly when it matters most. Charles Steidel, 2010 Gruber Cosmology Prize winner: "Observations of Structure Formation in the Adolescent Universe"
The Department of Astronomy & Astrophysics, the Kavli Institute for Cosmological Physics, and the Department of Physics are hosting a special colloquium on Friday October 15 at 4:30 pm in Assembly Hall, International House. Title: "Observations of Structure Formation in the Adolescent Universe"
The lecture will be proceeded by the Gruber Cosmology Prize presentation ceremony beginning at 4 pm. All are invited to the ceremony and the colloquium. Gruber Foundation Citation: Beginning with a series of breakthrough discoveries in 1995, Charles Steidel has led the exploration of distant galaxies, dating to an era when the universe was only one-tenth its current age, or about 12 billion years ago. That research not only extended astronomy's reach into the past but expanded cosmology's understanding of how galaxies have formed and evolved throughout the history of the universe. October 19, 2010 will be the 100th anniversary of the birth of Subrahmanyan Chandrasekhar. This symposium is an occasion for those who knew Chandra to commemorate his life and work, and for those who did not know him to experience firsthand some of the impact he had on 20th century science. We will have an opening reception on October 15 and full days of scientific talks on October 16 and 17. The banquet will be held on the evening of October 16. Prior to the start of the Symposium, the 2010 Gruber Cosmology Prize will be awarded. (The recipient will be announced on June 2.) The ceremony will begin at 4:30 PM in Assembly Hall at International House, 1414 East 59th Street, and will be followed by a lecture by the recipient. See www.gruberprizes.org for more information about the Gruber Prize. * Oct. 17: Symposium talks, 8:30 am to 6:00 pm, Assembly Hall, International House, 1414 East 59th Street. There is no registration fee for the Symposium for University of Chicago faculty, students, and staff, but there is a $50 charge for those who wish to attend the banquet. If you plan to attend the Symposium and/or the banquet and you have not already registered, please do so within the next few days, so that we can have an accurate count of participants and banquet attendees. The registration form can be filled out online. Frontiers 2010 workshop sponsored by the Joint Institute for Nuclear Astrophysics (JINA) is the third in a series of JINA meetings to bring together all JINA participants, collaborators, and other interested researchers to discuss recent and/or planned research in nuclear astrophysics. The workshop will be held at the Abbey Resort at the shores of Lake Geneva, WI during Oct. 21-23, 2010. The meeting will start on Oct. 21 at noon, followed by two days dedicated to oral presentations with ample time for discussions. The meeting will end Saturday Oct 23 at noon. The workshop will also include a reception and a social event on the evening of Oct 21 at Yerkes Observatory. A tour of the observatory will be available for interested participants. Although a few invited overview talks on topics of current interest will be presented, young researchers are especially encouraged to present their research work. All the presentations will be available at the JINA web site after the meeting's conclusion. There will be a wine and cheese reception following the colloquium. Confirmed speakers include: Steven W. Barwick (University of California, Irvine), James H. Buckley (Washington University), Donald C. Ellison (North Carolina State University), Johannes Knapp (University of Leeds, UK), Dietrich M�ller (University of Chicago), Steve Ritz (University of California, Santa Cruz), and Floyd Stecker (NASA's Goddard Space Flight Center). Benjamin Dean Lecture: Josh Frieman, "The Dark Universe and the Origin of Structure"
Josh Frieman is a senior staff scientist at the Fermilab Center for Particle Astrophysics and Professor of Astronomy and Astrophysics and a member of the Kavli Institute for Cosmological Physics at the University of Chicago. He currently directs the Dark Energy Survey, a collaboration of more than 120 scientists worldwide which is building a 570-Megapixel camera for a telescope in Chile to probe the origin of cosmic acceleration. Please mark your calendars for the Astro Department Holiday Party, Tues.
Dec. 7 from 5-8 pm in the Smart Museum of Art. Family members are welcome! The next decade will be the decade of the WIMP, the best candidate for dark matter. Astronomers tell us dark matter exists, as well as how much there is. Cosmologists have a simple, elegant, compelling explanation for dark matter: a weakly interacting massive particle (WIMP) that was produced in the primordial soup. If WIMPs are the dark matter, we should be on the threshold of producing them at accelerators like CERN or Fermilab, or detecting the relic WIMPs underground. We should soon know if WIMPs are the answer, or just another simple, elegant, and compelling, but wrong, explanation. Discounted parking will be made available to the first 50 attendees at the 222 E. Huron St. garage. Instructors: Louis Abramson, Alissa Bans, Immanuel Buder, Matt Bayliss, Nicole Fields, Walter Glogowski. 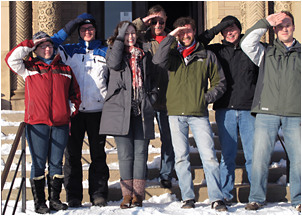 The 2010 KICP Yerkes Winter Institute explored the importance of surface area. Over three days, students cycled through three daytime laboratories ranging from a parachute experiment, "What a Drag", to the basics of friction, "Slip Sliding Away", to the influence of surface area on reaction rates, "Plop Plop Fizz Fizz...". Nighttime activities included exploring the wonders of the winter sky by hunting for constellations, satellites, and planets using both naked eyes and binoculars. The birth and evolution of stars were also investigated by observing the Pleides and the Orion Nebula with the 24-inch telescope. While, another evening lab explored the importance of "collisional cross sections," in physical, chemical, and even astronomical reactions by examining the concept of cross sections via a kinesthetic learning experience, aka a snowball fight. The instructors in residence included five KICP graduate students and a public school teacher, another half dozen KICP member helped to design experiments and plan the institute.